Anne Boleyn’s lament, “O death, rock me asleep,” performed by soprano Anna Dennis with the San Francisco-based Early Music ensemble Voices of Music. 4K ultra high definition video from the ensemble’s Great Poets concert, January, 2015. Voices of Music is creating a worldwide digital library of music videos, recordings and editions, free for anyone in the world. To support this vital project, which will enable new generations of people all around the world to enjoy Classical music, please consider a tax-deductible donation or sponsor a recording project. With your help, anything is possible! Our story begins in the Tower of London in the year 1536, where, according to legend, Anne Boleyn, the Queen of England from 1533 to 1536 as the second wife of King Henry VIII, wrote the poem “O Death, rock me asleep” on the eve of her execution. Anne was a pivotal figure of the English reformation, and her short and meteoric reign captured the imaginations of poets, politicians and people from all walks of life for generations. But could she have written the poem, or, as a skilled musician and lutenist, the song itself? Indeed she could have, but we will never know for certain. Although the Queen was closely guarded in her final days, the web of intrigue in the Tower and at court could have allowed her paper and quill. Of the two authentic 16th-century manuscripts that provide musical clues, the most remarkable is a song manuscript in the British Library, which has the text, the tune and a part for the lute written in tablature, a type of musical notation invented by lute players to write musical shorthand. Although a number of reconstructions of this work have been made, including one by Arnold Dolmetsch for keyboard and voice, our analysis of the music in the lute part indicates that it is a lute transcription of a lost polyphonic partsong: a five-part composition for string consort. The clues in the music can be unraveled if we make a few careful assumptions. If the original consort music was written in five parts, this solves a number of contrapuntal problems in the writing, and, if the ground bass is always present in one or more of the voices, this limits the number of possible realizations. Assuming the above to be the case, the, the rest of the musical voices can be derived from the rules of 16th-century counterpoint, and so we can reconstruct the original version. The lute tablature clearly marks all of the harmonies in the final coda on the words “I die” as “mi contra fa”–B Flat against B natural–which is possibly the the most unusual sequence of cross-relation dissonances from the time. The syllables “mi” and “fa” are emphasized in the text of the poem–“Rock me asleep” and “Farewell”, symbolizing the extreme emotions of the author. 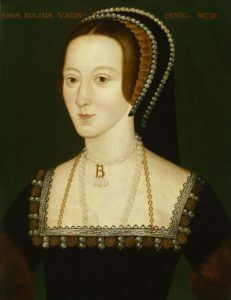 Anne Boleyn (c. 1501 – 19 May 1536) was Queen of England from 1533 to 1536 as the second wife of King Henry VIII, and Marquess of Pembroke in her own right. Henry’s marriage to Anne, and her subsequent execution by beheading, made her a key figure in the political and religious upheaval that was the start of the English Reformation. Copy of a portrait painted c. 1534. The authorship of the work is entirely speculative, as is any attribution based on style. In addition, it would have been very risky, to say the least, for a musician at the court of Henry VIII to pen such a work, although Anne had many friends. Both the style and the structure of the work are unusual, and, as there is no close parallel, the music is therefore difficult to date. Nonetheless, it is tempting to speculate on the author of the setting. One possibility is Philip van Wilder, musician and lutenist to the court of Henry VIII: van Wilder was certainly qualified in that he was equally at home composing in the the old-fashioned, dense counterpoint of the Netherlands school of composition as well as the simpler French styles in vogue in the 16th century. Next, van Wilder–who was the same age as Anne–wrote several elaborate works using simultaneous cross relations and repeating thematic patterns, as is the case for Anne’s lament. Another possibility is that the work could have been written after Henry’s reign, when Elizabeth I—Anne’s daughter—was queen; in this case Alfonso Ferrabosco I, who served the queen for decades, could easily have composed such a work. Both the poem and the musical composition created ripples throughout the 17th century -William Shakespeare quotes from the song on five separate occasions in five different plays,- more than any other text- and the gloomy ostinato of the music was used 100 years later by the composer Henry Purcell. My pains who can express? Toll on the passing bell, etc.